Turkey time. Are you getting ready? Christmas is fast approaching and brings with it joys and stresses for most people. A lot of pressure for one day. Sometimes I don’t know why we save everything for the one day. Turkey is one of those dishes that can be a bit intimidating and give people performance anxiety in the kitchen! Have you heard that saying, take a turkey and 2 chickens and roast them, the throw away the turkey and eat the chickens. I can understand and I think there are good reasons for it. I’ve often heard people express their disappointment. 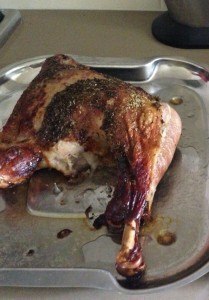 Complaints that the breast was too dry, or they don’t like the leg meat. The other problem being, for most people it’s not a regularly cooked meat, as a whole, but has gained a greater popularity since the introduction of turkey mince, which is easier to cook and accessible throughout the year. Having said that there are also the “rolled” turkey breast. Please check the packaging, some of them are like a manufactured meat, and in my opinion, an inferior product, and frankly, not really worth the trouble. Having cooked turkey many times over the years, I believe I have discovered the root of the problem. This is entirely my own opinion, but, I think what we are dealing with here, are two entirely different meats. The legs and the breasts. The other issue is that when stuffing a turkey, I believe, the meat, is sacrificed for the stuffing. By the time the stuffing is cooked, because the beast is so large, the breast can become dry. So, this is how I do it. Treat them as separate entities. 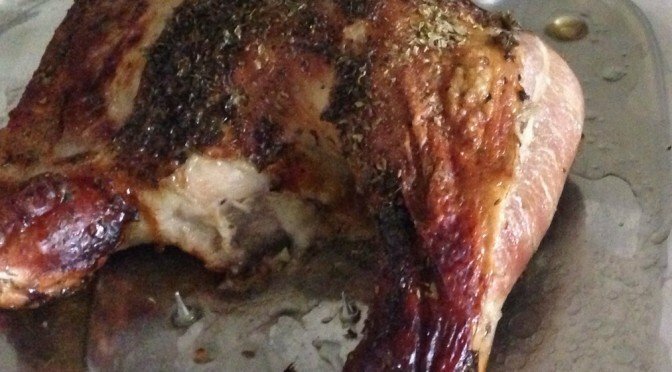 Now, some people may think that the leg meat, or turkey hind quarter, is inferior, but when cooked separately to the breasts, makes a beautiful roast. Anyone can cook it. What it requires is a little fore thought. They are not always available, but at times can be found in the frozen section of the supermarket. For under $10 – a delicious meal can be made. If you propose to cook a roast (from frozen state), on the weekend, get it on a Wednesday. Put it on a large plate or dish on the lowest shelf, of the fridge. It will need 48-72 hours to defrost. it must be defrosted in the refrigerator. Two main reasons. For safety in food preparation, to prevent the growth of micro-organisms from uneven temperatures, then once it is defrosted to promote even cooking.